We were delighted to participate in the GIN 2012 Conference “Support your future today! Turning environmental challenges into business opportunities”. Our conference was held from October 22-24 in Linköpig, Sweden. The East Swedish region is well known for its “Triple Helix”, (i.e. strong cooperation links between industry, government and knowledge institutes), innovative SMEs, Clean Technology and bio-fuel production synergies. Lessons from Experience and New Frontiers in Theory and Practice. Azevedo, S.G., Brandenburg, M., Carvalho, H., Cruz-Machado, V. (Eds.) 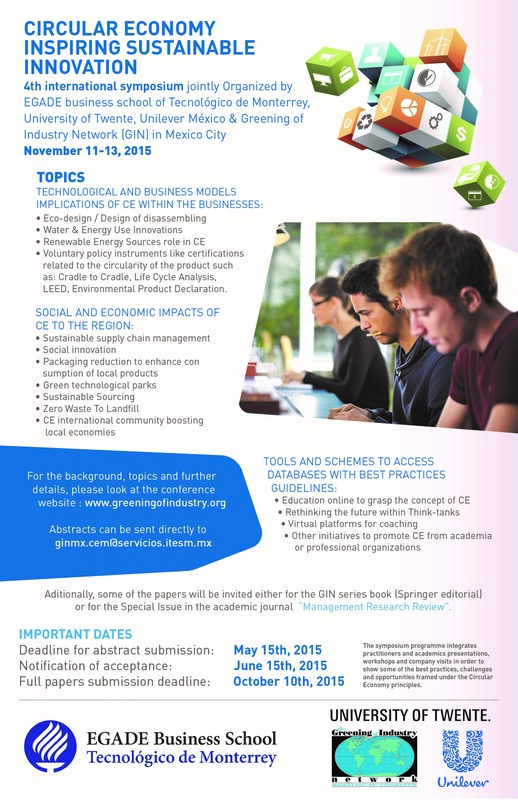 2014, XIX, 314 p.
Series: "Greening of Industry Networks Studies", Vol. 3. Vazquez-Brust, Diego A.; Sarkis, Joseph; Cordeir, James J. (Eds.) 2014, XXV, 322 p.
For further description click here. A number of arguments are made by an international group of authors in this though provoking book about an understudied and socially important context. A future in which financial wealth transfers across the North-South divide from richer to poorer countries is far from sufficient for the relief of poverty and the pursuit of sustainability. Caution must be taken when growth is achieved through the liquidation of the natural wealth of poorer nations, in order to maintain a global economic status quo. Neither poverty reduction nor sustainability will ultimately be achieved. The financial collapse and social upheaval that might result will make the most recent economic downturn look trivial by comparison. 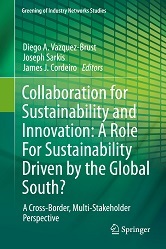 What is more urgently needed instead, as argued in this book, is collaboration for sustainability and innovation in the global South, especially building on models originally developed in the South that are transferable to the North. In pursuit of a sustainable and more equitable future, the book examines such topics as Cross-Border Innovation in South-North Fair Trade Supply Chains; Potential Pollution Prevention Programs in Bangladesh; Digital Literacy and Social Inclusion in the South through Collective Storytelling and Eco-innovation at the ‘Bottom of the Pyramid’. Many of these stories and have not been told and need greater visibility. The book contributes in a meaningfully to the discussion of how innovation and sustainability science can benefit both sides in South-North innovation collaborations. It provides useful introduction to the topics, as well as valuable critiques and best practices. This back-and-forth flow of ideas and innovation is itself new and promising in the modern pursuit of a fair and sustainable future for all regions of our planet. Management Research Review (36:12) December 2013. 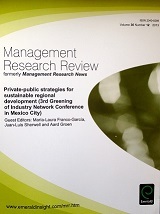 Special issue inspired from the topics addressed during the 3rd GIN conference in Mexico City (April 2012). The main research questions driving the conference theme were: Why Strategies for Sustainable Regional Development? And can collaborative stretagies by multi-stakeholders facilitate the conditions towards sustainable regiocal development models? Partnership among GIN, the University of Twente (CSTM-NIKOS-IGS) and the "Instituto Tecnologico y de Estudios Superiores de Monterrey made possible the elaboration of this Special Issue as scientific coutcome fo the conference. Guest editors of the MRR 36:12 (Maria-Laura FRANCO-GARCIA, Juan SHERWELL, Aard GROEN) invite you to read and provide your comments. Send an email to info@greeningofindustry.org.